Portobello mushrooms are my new favorite thing. The other day I needed something quick to make for dinner so I did a search using only the word "portobello" and stumbled upon this gem. A quick and tasty meal that is a healthy twist on a classic sandwich. Messes: After purchasing all my ingredients I forgot to look at the recipe again. I just went ahead and made it how I felt it should be done. 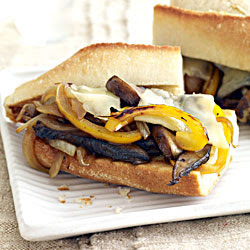 I sauteed the peppers, onions, and portobellos in olive oil, piled it on a hoagie and toasted it in the oven with a slice of cheese over top. It was great but now that I'm looking back at the original recipe I realized that I forgot about the Worcestershire sauce. Next time I'll use that as I'm sure it would make it even better! Successes: I will absolutely make this again -- and next time preferably for other people because I had way too many leftovers.